Next year's Assassin's Creed game will take place in London during the 19th century, Kotaku has learned thanks to an early leak. Farewell, Napoleon; hello, Jack the Ripper? Victory is something of a shift for the series in a few ways. For one, this is the first Assassin's Creed game helmed by Ubisoft's Quebec studio, as opposed to their primary Montreal office, which has led development on the biggest Assassin's Creed releases since the first game in 2007. Earlier this year, the Ubisoft Blog teased that Quebec would be heading up a future game in their annualized series, but they didn't say much more about it. This is that game. Of course, just about every major Ubisoft game is developed by teams of hundreds that work across all of their studios across the world, from Canada to China. But it's significant to see an Assassin's Creed game led by a new team. Ubisoft Quebec also developed downloadable content for Assassin's Creed III (The Tyranny of King Washington) and Assassin's Creed IV (Freedom Cry). We also hear that this will be the only main Assassin's Creed next fall—unless something changes, we won't see two separate entries like we did this year with Unity and Rogue, according to a person familiar with goings-on at the company. Next year, Assassin's Creed is sticking to current-gen platforms and seemingly leaving the Xbox 360 and PS3 behind. The annualized Assassin's Creed franchise is in a strange spot at the moment and has seen calls from some fans to take a year off, something that doesn't appear to be happening. And given how impressive Victory looks so far—and the implication that it must be pretty far along to already be looking this good—perhaps it doesn't need to. Still, it was just a week ago that Ubisoft had to apologize for the technical problems marring its newest major game in the franchise, Assassin's Creed Unity. Tepid reviews of Unity haven't helped, and a humble Ubisoft has opted to no longer charge fans for that game's major expansion, Dead Kings. Some Assassin's Creed fans among the Kotaku readership and elsewhere online point to Unity, delayed from October to November yet still having launched in sub-optimal condition, as a sign that 2015 should be a skip year for the ubiquitous series. Ubisoft has instead appeared to be as ambitious as ever about its top franchise, releasing the old-gen AC Rogue last month as well and planning an AC sidescroller set in China for release some time in the next few months. Earlier this year, we told you about Unity and Rogue before they were announced. Today we can tell you about Victory, thanks to a seven-minute "target gameplay footage" video leaked to Kotaku that demonstrates what Ubisoft's dev team expects from the upcoming Assassin's Creed game. The video is surprisingly slick and could pass for an E3 presentation, and although it may not represent what the final game looks like, the beginning of the video proclaims that it was produced entirely in Anvil, Ubisoft's Assassin's Creed engine. In other words, it wasn't pre-rendered. To the eyes of Kotaku staffers who have played recent AC games—and likely to those of you seeing the shots in this article—Victory appears to be using the version of the Anvil engine seen in Unity, the best-looking incarnation we've seen so far. 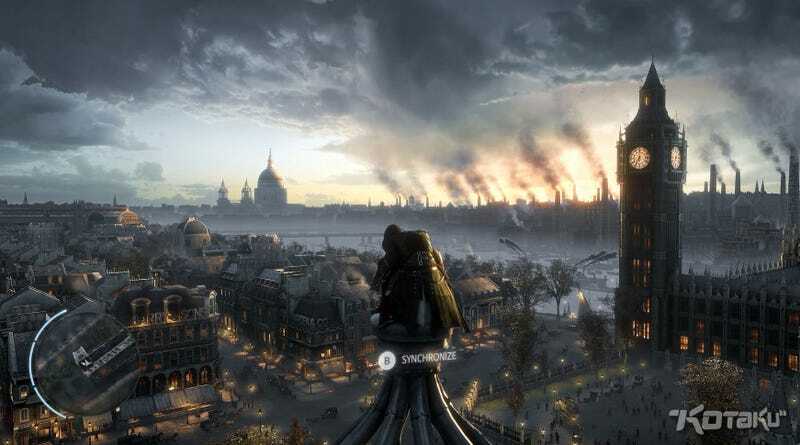 The video begins with an assassin, presumably the game's protagonist, climbing up a tower and looking out at the city of London. We get a quick overview of the city as the camera flies from alley to alley, showing us some of the game's potential side activities (gambling in a pub, street-racing with carriages, and so forth). We then cut back to the assassin, who leaps down to the street, makes his way into a nearby horse carriage, and accepts an assignment from a mysterious masked woman. The task: kill a man named Roderick Bulmer, who has been trafficking little girls for the assassins' ancestral enemies. "The templars must receive our message," says the woman. "You must send it in blood." Mid-conversation, the carriage is attacked, so the assassin makes his way out and takes out several enemies—who are bearing templar insignias—while keeping his balance atop the moving buggy. It's frantic. A few quick kills later, the assassin arrives at the Charing Cross railway station, where he swaps his hood for a top hat and runs through the crowd, ignoring side quests ("stop that thief!") as he hunts down Bulmer, who is standing among the crowd in the middle of a train plaza. Our assassin hops and leaps to a platform overlooking the trains, takes out a guard, then uses what appears to be a new item—a grappling hook—to swing over to Bulmer and stab him in the chest. Once Bulmer is dead, the assassin jumps onto a moving train and fights off more templar soldiers while crossing the River Thames. As the video draws to a close, our protagonist leaps from the train into a conveniently-placed haystack, then staggers forward as the camera pulls toward the London horizon. Then the logo: Assassin's Creed Victory. The takeaway from the footage isn't just that Assassin's Creed is in a new place and era yet again. It's that, apparently, Ubisoft is pushing for some gameplay innovation. We can see that in the multiple fights on moving vehicles. And we can see that in the introduction of the grappling hook, which seems, at least when used inside a massive, covered train station, to allow the player-controlled character to create literal jumping-off points on the fly. If that grappling hook works the way we think it does, then players would be able to walk into any covered space in Victory, shoot at the ceiling to drop a rope from it and then swing over to assassinate a target—or maybe escape into a crowd? This could significantly change how these games play and how gamers move through an Assassin's Creed world. It appears that Victory will build on the same internal Ubisoft graphics engine—Anvil—that made Unity's Paris so striking. One hopes that Ubisoft will have its tech and its game better bug-tested for Victory. If so, this could be a good one, as the setting and the gameplay look like winners. We asked Ubisoft for comment about the timing and platforms for the game. If they decide to say anything, we'll let you know. It is always unfortunate when internal assets, not intended for public consumption, are leaked. And, while we certainly welcome anticipation for all of our upcoming titles, we're disappointed for our fans, and our development team, that this conceptual asset is now public. The team in our Quebec studio has been hard at work on the particular game in question for the past few years, and we're excited to officially unveil what the studio has been working on at a later date. In the meantime, our number one priority is enhancing the experience of Assassin's Creed Unity for players.